Anyone have any experience comparing zooms lens from the 70-80s to those from the 90s and early 2000s. Seem like a lot of zoom lenses from the late 90s can be had for really cheap (like Sigma, Tamron), these lenses are generally made of plastic and feels cheap but have the optic design improved since the 70/80s to be better performers? Thoughts? AF lenses often have limited focus throw, absent manual aperture control, sometimes better optics. Okay, here's my take, for what it's worth. First of all, I'm not at all familiar with zooms that were made in Europe, so others will have to speak to those designs. I'm mostly familiar with Japanese made optics. The earliest zooms, such as the ubiquitous 90-230 that must have been available in 100 different brand names, are perfectly suitable as boat anchors. But not much else. Some early zooms -- and I'm referring to 70s vintage stuff here -- are excellent. For example, Canon was very slow to introduce zooms. Canon pledged that the only way they would produce a zoom was is if it were equal in performance to its primes. Thus we had very expensive examples, such as Canon's first 35-70mm f/2.8-3.5. And Canon's slightly less expensive 80-200mm f/4 two-ring zoom. These were top-notch zooms then and they're still top-notch zooms. And of course there were the well-known Vivitar Series 1 zooms of the mid-to-late 70s, like the 70-210 series and the remarkable 28-90mm f/2.8-3.5 varifocal. By the early 1980s, it appears that lens designers were getting a pretty good handle on zoom designs -- using computers to aid their quests by that time. There were a lot of very good "amateur" grade lenses made during this time frame. By the mid-1980s, lens designers were beginning to include exotic glass in their formulas, like Nikon's ED, Canon's L, Tamron's LD, Tokina's SD, Sigma's APO. Minolta made some APO lenses then too, but I'm not all that familiar with Minolta's offerings. Many lenses from this period were real stand-outs. Nikon's fantastic 200-400mm f/4 ED, Canon's brilliant 80-200mm f/4 L, Tokina's surprisingly sharp 100-300mm f/4 SD, Tamron's excellent 80-200mm f/2.8 LD, and others. All these lenses rivaled primes in image quality. By the late 80s and early 90s, everything has become AF, and many of these designs are mostly plastic in construction. There were still some great lenses being made during this period, but I don't have much experience with them. I've owned only a couple AF zooms from this period. They're both very good zooms, but I wouldn't necessarily praise them as being some of the finest of their time. And since then I've owned only a couple more AF zooms, both Nikon, a 28-105 AF-D and a 70-300 AF-D ED. I had high hopes for that 70-300, since it's an ED lens, but its performance is just OK. Sorta disappointing. My old Tokina 100-300/4 SD is better. One thing I do like about Nikon's AF-D lenses is they still work well as manual focus lenses. They have decent focus throws and the focusing collars are reasonably well damped. I've been a big Tamron fan for many years -- since the mid-80s. From what I've read, the Tamron AF lenses are still excellent quality, including their latest designs. So anyway, that's my take on things. What's yours? Zooms from the golden era (metal bodies good coatings mid 60 to late 70's) were definitely a mixed bag. I have some Konica and Olympus zooms I am at work and don't recall the designations exactly but the Oly was likely a 75-150 maybe, while the konica was an unusual range that no one else ever made 60-110? Those at are both pretty good. Modern zooms have gotten pretty darn good. Most people would not be able to tell them from primes until you enlarge a bunch or pixel peep. Back when I was rockin the EOS 60 D I sprang for a Tokina AF ultra wide (for crop sensor IIRC it was 11-16 AT DF something something something) . It was surprisingly good. I sold on ebay for very near what I bought it for new. Though I'm with you on the boat anchor thing. Lots of really poor performers from the early years of zooms. As for current-ish stuff I currently have the Zeiss 16-35 f4 which is stellar but it lacks manual focus which I find annoying. I was in Aus doing some diving and needed an AF wide angle for the Meikon housing. I also have the Sony G 70-400 in A mount which I use via a LAEA4 it is also extremely good. It should be for the price I paid for it (used!). The other super good AF I have is the Carl Zeiss 24-70 Vario Sonnar 2.8. Which is a fantastic lens but a beast, as it is huge and heavy. For travel I have often opted for the lowly Minolta AF 24-70 which is absolutely the very best lens you can routinely buy for 25 dollars. I use that and the beercan and get 24mm to 210mm with very good images and low weight and risk if lost or damaged. I took some good pictures with those 90-230's! All right, there are some pretty bad early zooms, and I have posted a couple of epic failures - but in fact almost all are quite usable, for most practical purposes. You can shoot a fine portrait with just about any of them, and a sharp shot at infinity. They did well enough at consolidating the amateurs tele lens count, cutting out your 85, 105, 135, 200, even 300. Thats what they were for, to be a more versatile replacement of the ubiquitous 135. Everybody had a 135, and later everybody had an 80-200. Your National Geographic photo editor may complain, about CA or something, but in the end if you have nailed focus you have done well enough. And there are few photographers that ever needed to please such an editor. The biggest, most significant difference of the old heavy metal cheap zooms vs the equivalent plastic fantastics is that the old things are very heavy. That is an interesting reference. I bumped into some National Georaphic magazines from the mid 60's and was surprised to see how bad the printing quality and photos actually were. So the bad zooms of the 60's were very suitable for these purposes. Even the large printed hard cover photo books were at average really bad photo quality by modern standards. Apart from those already mentioned. Most of the more modest zooms from that era are good to excellent. These are zooms that didn't attempt too much in terms of reach, range or speed. 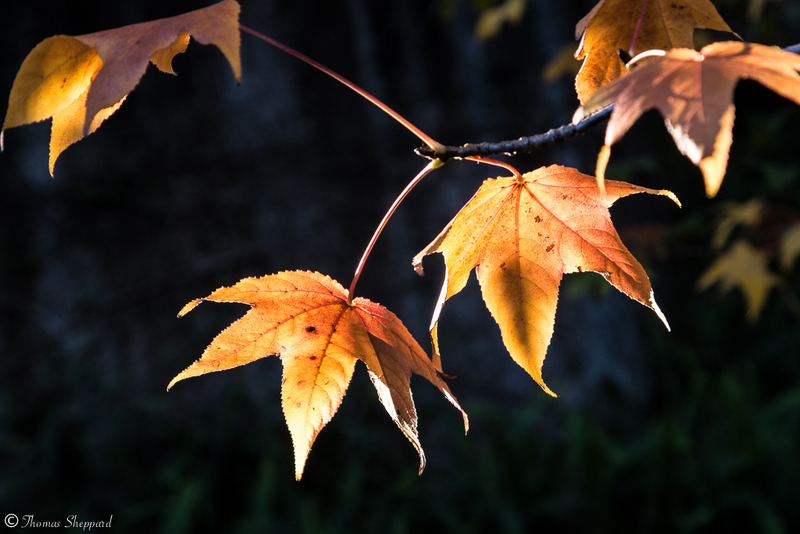 An absolute beauty is the Super Komura Uni Auto Zoom 75-150 f4.5 (beautifully warm in its rendition) as is the Super-Multi-Coated Takumar 85-210 f4.5 (cooler in colours but surprisingly sharp). It is interesting and among the old zoom lenses are good for Sony RM2 in the range of 24-35(40)mm ? My limited experience suggests even the maligned "90-230mm", in my case a Vivitar-branded TX model, still works perfectly well if you "fill the viewfinder" with the subject, rather than relying on cropping heavily as one can with "modern" lenses. In this instance, the Vivitar, having a built-in tripod-mount, was more convenient to use than my more modern lenses of similar range that don't have the mount. My only other currently-owned long "oldy" is an original Adaptall (not Adaptall-2) Tamron 200-500mm which does show "purple fringing" when cropped, especially if compared to my relatively modern Sigma 150-500mm, but when used to "fill the frame" is still perfectly adequate. These limitations are really shown up on a 24Mp camera, where the cropping capabilities are so much greater. On my 16Mp K-5 the camera started to "run out of resolution" at about the same time as the lens, so the nett effect was less obvious. The one old zoom I still use occasionally is my original Sigma 21-35mm, with the built-in "petal" lens hood, simply because I like the feel of it Again, I fill the viewfinder and don't bother to "pixel-peep" ... if the overall image is pleasing to me I'm happy! I have a few intermediate-range zoom lenses, mostly Adaptall-2s, in a box in the cupboard, that haven't seen the light of day in many years. Maybe, now I'm retired, I'll find time to "sit and play" one sunny afternoon, but don't hold your breath. Nice picks Tom. All created from the then relatively new crop of designers in the AsahiCo. stable, replete with Phd's in Optics - Sadao Okudaira, first at Asahi to have a Phd in Optics and an outstanding designer, Ogawa Ryota (also lead on the development of early Pentax autofocus), Matsuo Hirofumi (majored with telescopes, but as you say, made a pretty good 80-200 too). Wonderful link - thank you, I have not seen this information before. Maybe I should try it. It's only collecting dust in my collection up to now. I have one of these (Auto Sears), and I like it! I was amazed at the clarity of the close-up shots I could get with a macro helicoid. I have a rabid curiosity about the zoom-nikkor 43-86 f/3.5, which is supposed to be a complete dud. Like all lenses, the Zoom-Nikkor 43-86 needs to be learned. It is not a complete dud and I can't understand why that keeps getting repeated. Just for a bit of fun, here is a picture of the Super-Multi-Coated Takumar f4.5 85-210 against the SMC Pentax-M f4.5 80-200. Here is my test of that lens, it's definitely not a dud. 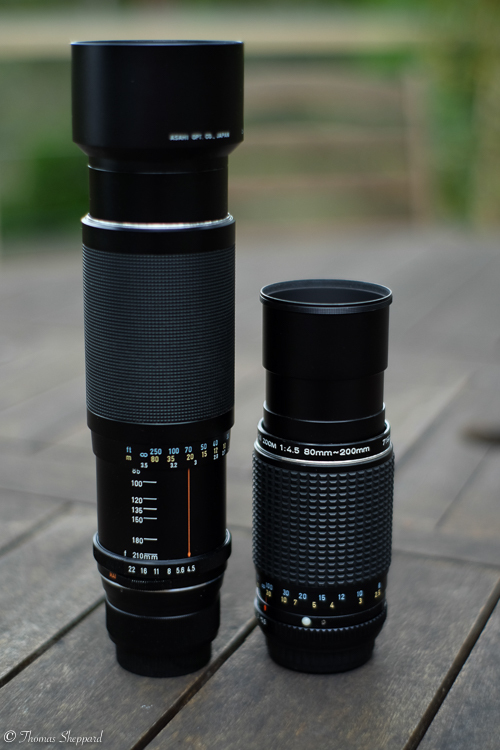 I have the "little" brother of that Takumar 85-210, the 70-150/4.5 (1964 or so), which is actually larger. That old trombone has such a long minimum focus that it comes with a dedicated 67mm closeup lens. Both M42 & K-mount versions of the SMC TAKUMAR-ZOOM 1:4/45-125mm are excellent performers. The focal range is perfect for crop sensor. Some unsettling experiences with zooms locking up (Vivitar S-1) and spilling ball earings (Olympus) made me try the "foot zoom". Two (or three ?) lenses with fixed focal lengths and making small or large shifts of vantage points , i.e. walking a bit when framing , did the same job. I never did snaps of sports, but did suceed in predicting where my children would be in focus. Landscapes and buildings never walked away, but might need me walking. Kodachrome II projected with a good lens on a 2metre wide screen seen at 3 metre distance did not show a shocking difference in quality, but I did find that the Summicron 50mm had a wide palette of separated nuances. Later, I found that good zooms were rather large, so I have mainly stuck with single focus lenses and they imposing some walking dicipline on me. I do however, on occasion, use zooms. I have read that current varieties can equal inflexible single focal lengths due to their ingenious internal mechanics. Probably just adjusting for different "conjugates" - close up or infinity- just like floating elements do on singel focal length optics. Mine are all manual relics from Leica and Zeiss (with Kyocera-Yashica-Tamioka mechanics), but for my modest requirements (no 4x10 metre billboards, rather at the most an A4 print to give away), entirely satisfactory and every bit as good as my fixed focus ones - for my purposes. With high resolution sensors and the options of cropping and stitching in Photoshop it has become quite tempting to just bring one, reasonably good, lens. I mentioned it specifically because I was skeptical of the negativity, mainly because of the kind of criticisms I've seen. Soft? Prone to flare? I don't care about that at all, even if it is true. I'm glad to see you fellows disagree with the reputation. I think I'll pick one up and try it. They seem to be quite inexpensive. Yes, the internet is often responsible for repetition of erroneous statements taken out of context. The Nikkor has suffered from these and that is reflected in the price. It was designed as a kind of kit lens - a standard zoom to cover normal to portrait-ish focal lengths. It really isn't a bad lens at all, and is as well made as other Nikkors of its time. It isn't very fast at f3.5 and of course people compare it with the much faster standard and portrait prime lenses. Granted, it isn't as good as these, but it was designed as a carry around utility lens, and it does well at that. Going on a family outing and want the convenience of only one lens? - it works well.